It’s another new year, so you may already be making some healthy changes to your lifestyle. Many new year’s resolutions include new diets and fitness routines to lose weight and get into better shape. But when you’re assessing your overall health, don’t forget the health of your mouth! Just like every other part of your body, your mouth requires specific nutrients and vitamins too. Okay, you probably already guessed this one, but for good reason. Calcium builds strong bones and teeth, and although it’s vital in childhood, you also need it to maintain strong and healthy teeth in adulthood as well. When your body is low on calcium, it leeches the mineral from your teeth and bones, which can increase your risk of tooth decay and cavities. Studies have also shown that people who don’t get enough calcium in their diet are nearly twice as likely to have periodontitis, or gum disease, than those who get the recommended amount. The jawbone is particularly susceptible to damage from low calcium, leaving you at even greater risk for gum disease. 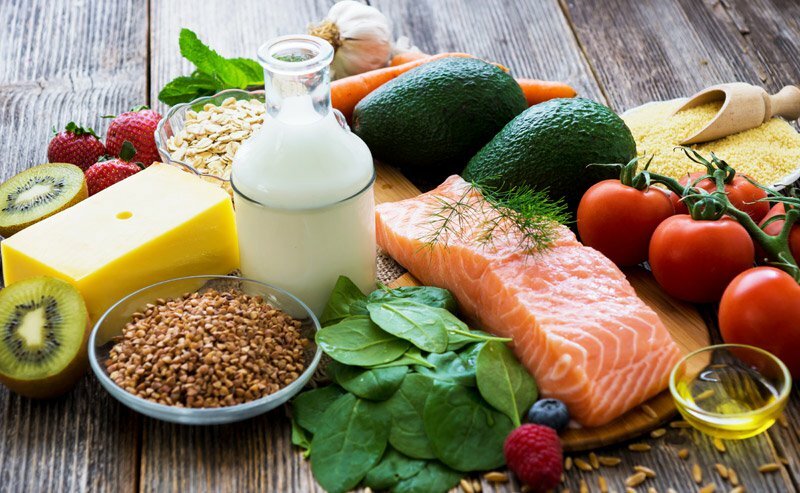 What to eat: In addition to dairy, good sources of calcium include leafy green vegetables, broccoli, sardines, almonds, legumes, oysters, and salmon. If you’re not sure you get enough calcium in your diet, you should consider adding a calcium supplement. Yes, calcium is at the top of the list, but vitamin D is a close second. Your body needs vitamin D in order to absorb the calcium it takes in, and to boost bone mineral density. Without it, your entire mouth would suffer from calcium deficiency, leading to underdeveloped teeth, gum disease, and tooth decay. What to eat: The simplest way to get your daily vitamin D is to sit in the sunlight at least 15 minutes per day, but the vitamin can also be found in fish, eggs, cod liver oil, canned tuna, and portobello mushrooms. You can also look for foods and drinks that have been fortified with vitamin D, such as milk, orange juice, and cereal. Like vitamin D, pairing calcium with phosphorus is necessary in order for calcium to fully absorb into the body and promote notable bone health. Luckily, most dairy products contain phosphorus, but calcium supplements don’t. What to eat: Good sources of phosphorus include seafood, such as scallops, sardines, cod, shrimp, tuna, and salmon. If you’re looking to get your phosphorus from plant-based foods, consider beans, lentils, nuts, and whole grains. You can also find phosphorus in beef, pork, and cheese. Vitamin C keeps the connective tissues of your gums strong, so it can protect against gingivitis. Gingivitis is the first stage of periodontal diseases, and it causes the gums to become red from inflammation, swelling and bleeding easily. What to eat: You probably already know that citrus fruits are rich in vitamin C, (oranges, grapefruits, tangerines, berries, etc. ), but you can also find it in leafy greens, sweet potatoes, peppers, broccoli, and even kale. Potassium, like Vitamin D, improves bone mineral density. It can guard against the weakening of supporting structures like the jaw, and is also is essential in blood clotting, which is good for your gums. What to eat: Most everyone knows that bananas are well known sources of potassium, but it can also be found in legumes, dark leafy green vegetables, squash, yogurt, milk, cheese, mushrooms, lima beans, tomatoes, Swiss chard, potatoes, sweet potatoes, avocados, and prunes. Best known for helping with eyesight and clear skin, vitamin A is also a good way to hlep maintain healthy mucous membranes and salivary flow in the mouth. It can keep mucous membranes healthy, and prevent dry mouth, which helps your mouth heal quickly. What to eat: For strong gums and teeth, load up on fish, egg yolks, and organ meats, like liver. You can also find it in leafy green vegetables like spinach, kale, and collard greens, or in orange-colored fruits and vegetables, like apricots, cantaloupe, pumpkin, carrots, and sweet potatoes. These fruits and veggies contain high levels of beta-carotene, which your body converts into vitamin A. So when you make your new year’s resolutions, don’t forget to include your oral health in your overall health plan. And while eating a balanced diet is important in maintaining your oral health, regular dental checkups are essential in ensuring that your mouth is as healthy as it can be. Call us to schedule a checkup today! For even more information on eating healthy for your mouth, visit the MouthHealthy website!